Trump is explained by Hanlon’s razor. Fox, breitbart, American thinker et al is a different beast. 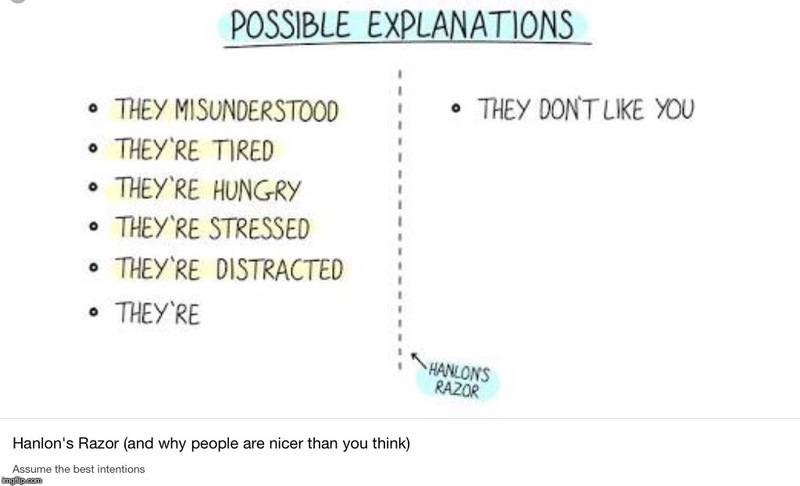 Hanlon’s razor is an aphorism expressed in various ways, including: Never attribute to malice that which is adequately explained by stupidity. It suggests a way of eliminating unlikely explanations (“attributions”) for human behavior and its consequences. Statements of this kind are known as philosophical razors. Bannon, Kochtopus etc are responsible for some of his shtick. I dont think Trump himself is in control or has any plan beside making himself more famous hence his brand more valuable. Yes. We are in agreement there. I look at it on an (unscientific) probability basis. And the overwhelming probability, in my view, is what you just said. Hmmm, I took a t bit of stick for posting information showing America has interment camps across the country ready to go at a moments notice. In fact some are manned 24/7 even though they have no detainees. However, Fintan O’Toole is a Leftie from what I’ve read. So he of all people should understand what fascism entails. After all, his tribe are the master fascists of our age. You took a bit of stick for swallowing Infowars nonsense hook line & sinker. No, I didn’t. I researched the subject myself. You saw the clip. Are you telling me the clip and those officials interviewed were fakes. ?Infowars had nothing to do with it. I saw the clip myself. I think it’s very highly likely those officials in were either actors or that the clips were edited or misrepresented & the information or scenes used completely out of their true context. Such as stacks of “plastic coffins”. The reason I mention nfowars Corky is because Alex Jones has ranted on for over a decade now about secret government concentration camps or prisons, where every US government of the time – except Trump’s oddly enuf – has had them dotted all over the country by FEMA, which is a fake authoritarian organisation which has had longstanding secret plans dreamed up by the dark forces, deep state, or illuminati, to take over the entire country. Usually accompanied by raves about how he’s gonna be prepared for them though. That he’s stocked up with guns & all the survivalist supplies marketed on his website. He’s part of the resistance. He was gonna go down shooting. Hurricane Katrina was it. That was the excuse. That was when they came for everyone & took every freedom loving citizen’s guns away from them, raped their women, killed their children …. All the thousands of federal and state police & military in the country were either in on it or had already been disarmed & taken away first. He’s modified some of his more outrageous claims in recent years. I found him great entertainment in the early years when he was so ridiculously outrageous. He’s a bit (a BIT) saner now, not quite so extreme. And his website does (or did) have plenty of true, but conspiracy-slanted, news items on things in the US or overseas like in Europe & the UK that government agencies or individuals or bought lawmakers in Congress do that just stink, by most people’s reckoning. But not all the things that Congressional lawmakers do that fit his faux-libertarian gun nut schtick. So that’s why Infowars has something to do with it. While FEMA facilities exist, they usually consist of storage and temporary-housing locations. The number of FEMA facilities is far lower than conspiracists would have you believe, and FEMA itself is a bumbling bureaucratic nightmare. If this is the New World Order, at least it’ll be quite inept at being Orwellian. Here’s the clip again so people can see if an Oscar should be awarded. I must admit I was wrong to call them internment camps. They are called residential centers….with no people..Lol. The lady at 3.50 is a good actress. Is Goff’s action to prevent free speech a sign of pre-fascist agenda? At least one left of centre commentator thinks so. So is this pre-fascist agenda coming from the left or right? And is Goff a pre-fascist tool by preventing free speech? The pre-fascist threat is definitely from the Right. I don’t think I have authoritarian tendencies. If we all have authoritarian tendencies, how & when do you think yours manifests itself? No, I didn’t think you were describing me. You said that, & I didn’t think that was true of me – or of by far the majority of people I know, in fact. Hence my very simple question. If you are happy & honest enuf to admit that you have this tendency yourself, and that it manifests itself in attitudes like being “Authoritarian … autocratic … rigid … doctrinaire … disciplinarian … dogmatic … unyielding”, then I would agree that I certainly observe some of those characteristics in your posts, but not all of them. Pre Fascism is a leftist tool, they no platform speakers, if you deviate from their thinking you are shamed as a racist, homophobe, islamophobe etc etc just for expressing an opinion. Want a job in the media, TV or film industry well you had better hate the President or you are getting no work. Want to work on campus as a lecturer same rules applies and even if you are have a read of what happened to Brett Weinstein at Evergreen. Want Brexit or voted Trump you better keep your head down now who is the fascist. 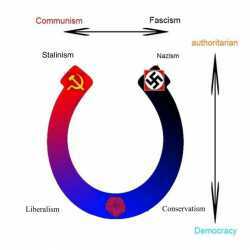 Fascism is just the northern extreme of the political compass, the alternative extreme of full blown communism. It belongs neither to the left or right. We have lived smack bang in the middle of the two for a few generations now, and it seems that proponents of both extremes are pushing their agendas. Its probable that the rise in pre fascism is due in large part to the strong socialist bent the world has been living under for the past few years. The only question that remains is how hard are the fascist ideologues going to push? The Trump model is Military-Industrial Corporate Capitalist Elitist Fascism. When are the left going to realize that Hillary lost the election to Trump because he was the other name on the ballet paper. This posting got me thinking (yep it happens sometimes) about the difference between fascism and communism. Scrolled through this discussion (especially the comments) for some background. Perhaps Goff is not pre-fascist but pre-communism? Either way we are not best served by a system as deprived as fascism or communism. It would seem the social democrat system is under fire from both the left and the right. The first victim is free speech as both fascists and communists have to quell free thought and as such is a common objective towards ultimate victory. Another alternative, IMHO, is that anywhere at all on the Left – Right spectrum is more-or-less entirely the lackey of corporate capitalist elites and that “free speech” simply doesn’t matter any more to those elites or their governments-on-behalf – who do their masters bidding not the voters – whatever hue of corporate capitalism those governments may display …? How else can you explain Trump’s shocking siding with long time arch enemy Russia, and at the expense of trashing his countries own intelligence agencies? Quite straightforwardly I would have thought. Trump sees himself at war with the Democrat supporting intel agencies that are trying to take him out. He also sees no point in attacking Putin personally while trying to make progress on the world’s trigger issues. How hard is that to understand? It’s very easy to understand. It’s a common excuse constantly used by Trumpophiles to explain all of his endless brain farts & chaotic, egotistical style of handling issues. I’m not completely convinced they’re wrong – but I’m still far from convinced they’re right. It’s the same approach he’s taken to his businesses, & although he often manages to come of them – at the expense of screwing all the employees, clients, & others who got involved in them – many have been failures. And those blindly trusting souls who got sucked in & believed his crazy, ego-driven bs hype, who took the hit, disasters. It’s the same approach he’s taken to his businesses, & although he often manages to come of them personally unscathed & even richer – at the expense of screwing all the employees, clients, & others who got involved in them – many have been failures. And, for those blindly trusting souls who got sucked in & believed his crazy, ego-driven bs hype, & who took the hit, disasters. And you blame Trump for mis-speaking? No. That was poor proof-reading on my part. I’m a shocker at it on the FiP because of its onscreen keyboard & other slow-action characteristics. I don’t blame Trump for ‘mis-speaking. It’s what he does. He’s not particularly ariculate & has a limited vocabulary. I blame him for lying when he lies though. And for fake news when he pushes it out there. And for being a whiny crybaby & a bully at the same time when he does it. Is all, as the yanks say. *articulate (& here’s the missing ‘ from the end of mis-speaking). Sorry, I’m eating bacon & a poached egg with grated cheese on toast at the same time as I’m typing. Old saying about retaining POWER; Create a Crisis & then offer ‘the only solution’.. WAR ? .. but you cant fool ALL the people all the time.. I think he has forgotten this ?? That’s a good enough reason to get down to Countdown and stock up on tinfoil. No. It wasn’t set up by Gehlen. But he was instrumental in the US intelligence services & was given a free ride because he brought with him all the Nazi Secret Service information & networks for espionage they had on the Russians. He was a German Russian intelligence specialist. Odd decision given the Nazi’s intelligence work outside Germany was a complete and utter failure. Not really. His contacts & knowledge & files were relevant to the Soviet intelligence apparatus, specifically, in East Germany. It’s interesting for me that Zedd should bring him up in this discussion because most people know nothing about him, but I bought & read a book about him when I was 15. I thought it would be about their activities in say the UK & USA but it was extensive on its history & activities – and a real surprise to learn that among other countries they’d had active agents in NZ who’d been caught & expelled. I saw a doco. on TV a while ago.. about ‘Nazis in USA’ inc. rockets/missiles (V1 & V2.. von Braun) & atomic weapons research etc. my memory may be a little ‘vague’ on some detail ? Oh absolutely the space programme, Zedd. Von Braun got a free ride after the war when he was shipped off to America with all his files, blueprints & I think some engineers. Thousands of deported forced workers from conquered countries & Jewish concentration camp slaves worked in the V2 component factories in appalling conditions. Without Werner Von Braun the US space program would have taken ages to catch up with the Russians. His work on the V2 was so useful & relevant to rocketry generally that he was central to the Apollo moon landing program. Not the US nuclear weapons though. German Jewish, & possibly other German, nuclear scientists who fled the Nazis WERE involved though. A large segment of the US voters have reservations about the fairness of elections in the US. The reservation is stronger amongst Independents and Democrats than Republicans. The politization of the electoral process and judiciary in the US doesn’t lead one to have confidence that this is going to change.